Regardless of the crops we grow or work with, the one thing we all have in common in the ag industry is complaining about the weather. It’s either too wet, or too dry or too hot, or too cold. When talking soybeans specifically, water stress (either too much or too little) is one of the biggest yield limiting factors in North Carolina. Soybeans are very sensitive to both too little and too much water. Soybeans are most sensitive to stress (wet or dry) during the pod development and beginning of seed set stages (R2 – R5). Often times, we get more stressed about too little rain than we do too much, but actually, wet stress has a slightly greater effect on yield than dry stress does. Across many of the farms in the Blacklands, drainage is essential for profitable soybean production. Over the last 10 years, controlled drainage (using riser boards to control water levels) has become popular as it can improve yields by approximately 10%, reduce undesired nutrient runoff, and conserve water. However, removing and adding riser boards is user intensive and tedious and many growers can’t get around to every farm before/after a rain event to add/remove boards, thus limiting the effectiveness of this system. 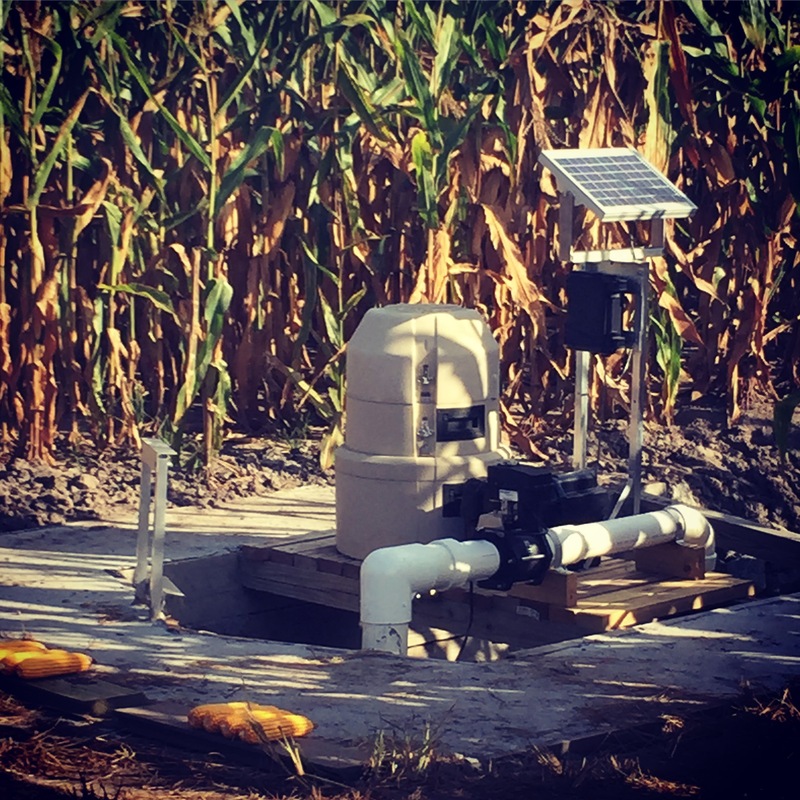 A drainage system that is automated with the ability to make real-time changes to the water table based on in-field feedback that has surface and subsurface irrigation systems could be very valuable to a grower. Imagine the potential yield advantages to a system that is able to make automated changes to drainage outlets as rainfall does (or does not) occur. The NCSPA is funding a project with the Biological and Agricultural Engineering Department at NCSU to investigate such a system. This system known as the SMART water management system merges the control systems on the drainage outlets with irrigation. SMART Irrigation system drainage control in a corn plot in Bath, NC. The study compares conventional draining (drain outlets continuously opened) to controlled drainage (drain outlets adjusted to a fixed time schedule) to the SMART water management system (combination of drainage and subirrigation based on water table feedback). 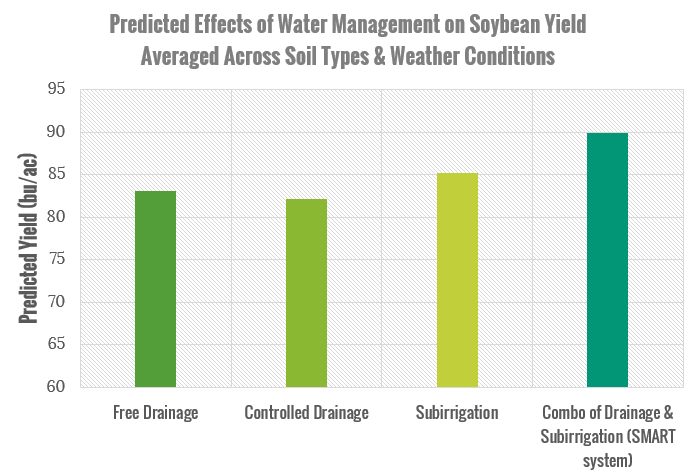 The modeling results of the study show crop yield and water conservation benefits of the SMART system in soybeans. This system has also shown impressive yield benefits in a corn rotation. It is being evaluated in soybeans this season at the Tidewater Research Station and an experimental site in Bath to confirm the modeling studies. An investment like this is not cheap and is definitely not a viable option for all our NC growers, but for some growers, the system may pay for itself in the long run. Once the yield testing is completed, the researchers will evaluate the potential ROI of the system to help growers make the best decisions for their operations. In addition, acceptance of the SMART drainage water management system by producers would be greatly enhanced if it were a cost-shared management practice and the possibility of including the SMART system as part of cost-share programs is being pursued. If you’d like to learn more about the SMART water system and see it in action, there will likely be a field day to discuss the system in August. Check back soon for more! Evans, R.O. and R.W. Skaggs. 1993. Stress day index models to predict corn and soybean yield response to water table management. Workshop on Subsurface Drainage Simulations Modules. 219-234.